Foundation formed for the purpose of raising the funds needed to replace the failing Bartlett Carry Dam. $500,000 raised from the community. No Government help. Lake-wide, winter and summer Algae Bloom. Lake was pea soup green for much of 1990. Contracted with Adirondack Aquatic Institute (AAI) to find the source of the Algae Bloom. AAI showed source of pollution was DEC Fish Hatchery. Identified from Lake bottom core samples and water sample analysis. Law suit filed against the DEC’s Lake Clear Fish Hatchery for excess Phosphorous discharges and not adhering to Water Pollution Control laws. Court forces DEC to upgrade its fish tank cleaning protocols to reduce Phosphorous discharges, leading to a 90% reduction in pounds of Phosphorous discharged. Completed rebuilding of Bartlett Carry Dam. Eurasian Water Milfoil discovered in Upper Saranac Lake. Hand harvested Milfoil, funded by grants from USF, under management of AAI. Foundation deemed that Milfoil growth is out of control. Engaged the Adirondack Watershed Institute (AWI) to develop a Program to combat the infestation. Foundation raised $1.5 million from Lake Community to fund a three year, intensive, hand harvesting, Lake-wide removal program. 18 tons removed in first year. AWI implemented stream monitoring program for USF to continuously monitor tributary input into the Lake. Guy Middleton hired as Lake Manager. Major reconstruction of the Bartlett Carry Dam is completed. 25 years of Water science analysis organized, digitized and centralized into a usable Data Base by AWI, to “implement and improved monitoring program” for USF. Information used to develop an annual monitoring of the 8-10 most important chemistries. Changes / threats to the Water Quality would be identified early and addressed. Foundation funded AWI for an Aquatic and Terrestrial Invasive Prevention and Preparedness plan, identifying the next invasive threats to the Lake – Preparedness, Prevention and Treatment if found, all leading to AWI and Lake manager programs to educate the community and to test for their presence. Lake Manager created an annual Asian Clam Survey of the Lake. Co-hosted two educational “Water Shield Workshops” with AWI . In the mid 1980s, issues facing Upper Saranac Lake began to expand beyond normal summer concerns over water safety, fishing reports and increased use of the Lake. The issues became more focused and defined by those things that, if not addressed, would have adverse long-term environmental impacts. Water quality, increased development, septic systems, invasive plants and pests, accumulating high-nutrient discharges into Upper Saranac Lake, and the failed dam at Bartlett Carry emerged as consequential or urgent concerns to a newly aware Lake community. As we gathered necessary information and scientific data, it became clear that we needed to raise significant funds to preserve the quality of our Lake and its water. 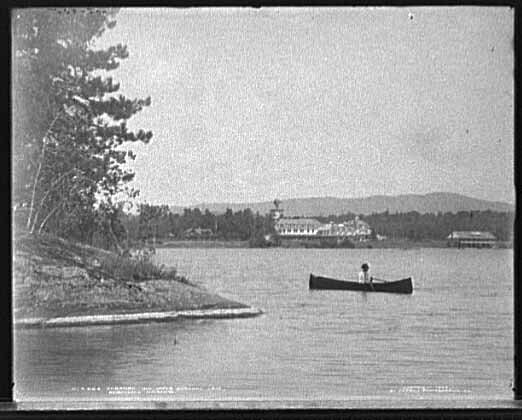 Deeply concerned members of the Upper Saranac Lake Association (USLA) undertook the establishment of the Upper Saranac Foundation (USF) in 1989 for just that purpose. Action was urgent because of the failed dam at Bartlett Carry. Fundraising began at the time that an IRS application for a 501 (c) (3) was filed. The Foundation’s by-laws specified a five-person Board of Directors, which would be accountable to its donors and the IRS requirements. Since its inception, the Foundation has raised $3 million, averaging nearly $250,000 per year over the last few years. Since 1989, the Foundation has provided funds for rebuilding the Bartlett Carry Dam, hiring a Lake Manager, acquiring Tommy’s Rock, launching the Lake Steward Program and undertaking various legal actions involving the local fish hatchery. The Foundation monitors septic systems, environmental breeches by developers, property owners, the Fish Hatchery, and the Bartlett Carry Dam to ensure compliance with all laws and regulations. In addition to being responsible for the scientific data involved with the Lake’s water quality (sample collection, testing and analysis), the Foundation funds and manages the issues relating to Eurasian Milfoil (remediation, educating the community and annual control efforts). All the Foundation’s efforts are focused on maintaining the water quality of Upper Saranac Lake. In 2004 it was determined that Upper Saranac Lake was significantly infested with Eurasian Water Milfoil (EWM). The Foundation expanded its Board to 15 members, rewrote its by-laws and re-evaluated its goals, priorities, and objectives. It developed and launched the most comprehensive EWM control project in the history of the Adirondack Park. One and a half million dollars was raised from the Lake community for a three-year EWM control project for Upper Saranac Lake and its environs. The successful, intensive hand-harvesting program reduced infestation to manageable levels. However, EWM can never be eradicated. An ongoing Milfoil control program is necessary. Each summer, divers map and hand harvest Milfoil to limit re-infestation. This project continues to consume the majority of the Foundation’s funds and management time. Budgeted goals have been achieved (or exceeded) every year. The Upper Saranac Foundation was conceived and formed by members of the Upper Saranac Lake Association, and it shares a similar mission statement and goals. As a charitable organization, the Foundation must operate at arm’s length from the Association. It has, and will, continue to work closely with the Association.